Sixteen-year-old Holly wants to remember her Grandpa forever, but she'd rather forget what he left her in his will: his wedding chapel on the Las Vegas strip. Whatever happened to gold watches, savings bonds, or some normal inheritance? And then there's Grandpa's letter. Not only is Holly running the business with her recently divorced parents, but she needs to make some serious money--fast. Grandpa also insists Holly reach out to Dax, the grandson of her family's mortal enemy and owner of the cheesy chapel next door. No matter how cute Dax is, Holly needs to stay focused: on her group of guy friends, her disjointed family, work, school and... Dax. No wait, not Dax. "You'll want to place your bets on Lindsey Leavitt's hilarious and heartfelt novel filled with family rivalry, forbidden love, life-changing secrets, and a hot boy dressed up like Cupid. 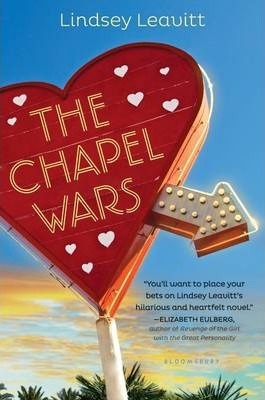 Just like Vegas, "The Chapel Wars "kept me up all night." --Elizabeth Eulberg, author of "Revenge of the Girl with the Great Personality""Leavitt's sense of place and ability to balance grief with hope make for an entertaining read." --"Publishers Weekly ""Holly's story could almost be a sitcom. But the hilarity is tempered by moments of genuine feeling . . . Readers will root for her as she attempts to preserve her grandfather's dream while beginning to imagine her own." --"The Horn Book Magazine""Leavitt creates some hilarious scenes . . . while maintaining a serious emotional tone . . . Recommend to readers who enjoy novels that blend light-hearted moments and gravitas." --"Booklist"""The Chapel Wars "stands alone as a funny, realistic, heartfelt novel that teens of all ages will enjoy." --"VOYA""Payton's alternately sarcastic, snappy, and reflective narration carries this insightful story." --"Publishers Weekly" on the ALA Best Book for Young Adults "Sean Griswold's Head" "Lindsey Leavitt made "me" want to go vintage. Readers everywhere will identify with this smart and likable heroine, as well as her yearning for a simpler and (seemingly) less complicated time." --Meg Cabot, "New York Times" bestselling author, on "Going Vintage""Lindsey Leavitt's best book yet. Mallory's voice is addictive! "Going Vintage" is witty, hilarious, real . . . impossible not to love!" --Becca Fitzpatrick, "New York Times" bestselling author of the Hush, Hush saga, on "Going Vintage""With perceptiveness and several fun plot twists, Leavitt's nuanced book is filled with quirky characters that readers will root for and believe in." --"Publishers Weekly" on "Going Vintage"